Last fall, when I went to the garden center to get seed garlic, there were several kinds from which to choose. (How Victorian of me to insist on not ending the sentence with “from”….) Staring at the various packages and names, they all looked pretty much the same to me. So, simply because I liked the idea of it in our garden, I chose “Music”. I have no idea what kind of garlic I have planted in the past. But this year is the first in many that the planted cloves produced anything more than spring garlic greens and a spindly scape or two. We’re thrilled with the result!! Sure, each garlic head isn’t that big, but considering how much sun our garden doesn’t get, the size of the bulbs is amazing. And the garlic itself is stunningly beautiful, almost transluscent, like a semi-precious jewel. Its flavour is sweet and fresh and sharp – but not too sharp. It’s perfect! No wonder people love garlic so much! Life truly is worth living with music AND garlic. The basil I planted, on the other hand, has not fared quite as well. It’s not that it isn’t flourishing. It is. But in a smallish, not-nearly-enough sun sort of way. We have enough garden basil to use as garnishes. Fortunately, most everyone else is smart enough to plant basil in full sun. And the other day, one of the nearby vegetable stores was selling huge clumps of it, with the roots still attached. I saw the giant aquarium full of basil plants and immediately thought: pesto! The woman at the store put the root ball into a plastic vegetable bag and handed it to me. Clutching it like a giant bouquet of flowers, I managed to stuff it into my back pannier, with most of the branches still sticking out. And I bicycled the short distance home, with the intoxicating scent of basil wafting behind me. As soon as I got home, I plunged the bouquet upside-down into lightly soapy water, rinsed it thoroughly and then put it into a vase for the leaves to dry overnight (if the leaves are even remotely damp, the pesto turns black). I WAS going to leave it on the counter. When it was clear that the furry black fiend, disguised as a cute little cat (whose favourite snack is green beans), was a little too interested, I put the vase into the section of the house where cats aren’t allowed. Don’t you love the smell of basil being whirred in a blender? We used to freeze pesto in ice cube trays – ice cube trays that can only be used for pesto because the garlic and basil smell cannot be removed. But one time when we ran out of the trays, we realized it wasn’t really necessary. Now, we wrap the lump of whirred leaves and garlic in a piece of plastic and freeze it that way. It’s really easy to cut off chunks of it when it’s time to have pesto for dinner. I think we still have some basil/garlic scented ice cube trays in the drawer by the broom closet. Do you know anyone who would like to have them? Music isn’t named for its beauty; it’s named for Al Music, a Canadian garlic grower. […] Bill Pennel who runs Rootstown Organic Farm […] stood behind a table filled with paper bags. Inside each was a single head of garlic with teh garlic’s name and taste description handwritten on the bag with a thick Magic Marker. […] In addition to Georgian Fire (hot, full-flavored), Pennell had Russian Red (strong, very spicy), Music (musky, mellow), and Romanian Red (strong, long-lasting). Like all garlic, it should be kept at cool room temperature, dry (airy) and dark for longest storage, but not chilled. Garlic, like daffodils, does much of its root development in cool to downright cold autumn and early winter weather. If you keep it in the refrigerator, it is likely to think that this is what is happening and that it’s time to grow. Fresh garlic has the best flavour and gets stronger with age. Crush or finely slice garlic to bring out the health-giving allicin compound before using. 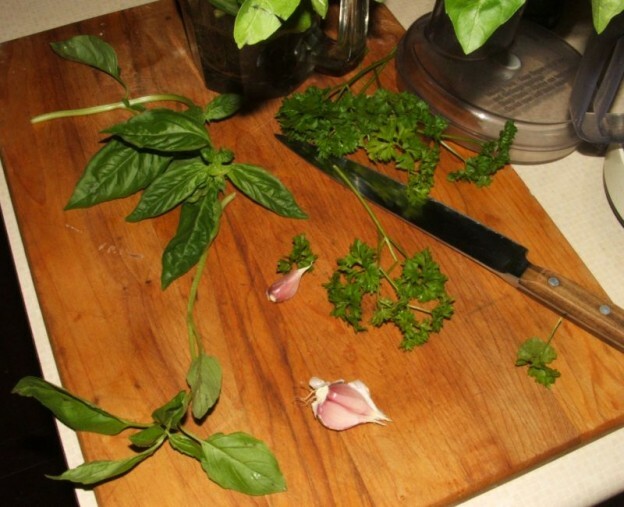 To reduce the sulphur odour, cook garlic and chew fresh parsley as a breath freshener. The usual method for growing garlic is to break each bulb (the part that grows under the ground) into cloves, and to replant the cloves separately in autumn. Each clove grows into a whole new bulb, which is harvested in mid-summer. Normally, growers remove the scapes (the flower stems) in early summer, to allow bulbs to grow larger. That makes sense, and it really makes a difference. If you leave the scape intact, the plant divides its energy between scape and bulb growth, so the bulb ends up smaller. However, if you let the scape grow and mature, at about the same time that you harvest the underground bulb you can also harvest tiny teardrop-shaped “bulbils” from the top of the scape. Each bulbil is like a tiny garlic clove, and it will grow if you plant it. After one season, most bulbils grow into a small round bulb that isn’t divided into cloves, sort of like a crocus or tulip bulb. These “rounds” can be peeled and eaten, but if they’re planted for a second year they usually grow into a regular garlic bulb, with the usual cloves. [Y]ou can grow different varieties right next to each other with no crossing, because there’s no pollen involved in this propagation. […] [T]he main advantage of bulbil-grown garlic is that properly harvested scapes don’t carry soil-borne plant diseases that infect the underground bulbs. Growing garlic from bulbils can reduce the transmission of diseases and pests that can be carried on cloves, or on soil. Once the initial two-year wait is over, as long as you continue to plant in soil that hasn’t been exposed to garlic diseases or pests, you can just plant the cloves every year as usual, harvesting great garlic every year. Rats!! Next year, I will definitely let one of the scapes flower and plant the bulbils! I was going to submit this post for Weekend Herb Blogging but alas, it looks like that wonderfully informative event is no longer happening. What a testiment to Kalyn (and Haalo, who took over the administrative duties around year 3) that it lasted for 8 years! This entry was posted in food & drink, WHB on Saturday, 8 August 2015 by ejm. Wordless Non-Wednesday: Have you tried Champfleury?